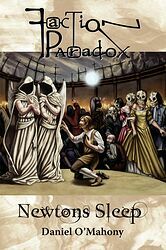 Faction Paradox are a spin-off from the Doctor Who novels of Lawrence Miles. Most frequently described as a "time-travelling voodoo cult", they made their first appearance in the 1997 novel Alien Bodies and subsequently have spawned their own range of spin-off books and audio dramas (the audios are listed on a separate page). Most of the books are full-length novels, except for the "fictional history" The Book of the War, plus A Romance in Twelve Parts, Burning with Optimism's Flames and Liberating Earth, which are all short story anthologies.